PRO LEGE REGE ET GREGE: For the Law, the King, and the Nation. This image is from the final page of the New Testament in English, edited from the Tyndale version and printed by the London-based printer and bookseller Richard Judge or Jugge (d. 1577). 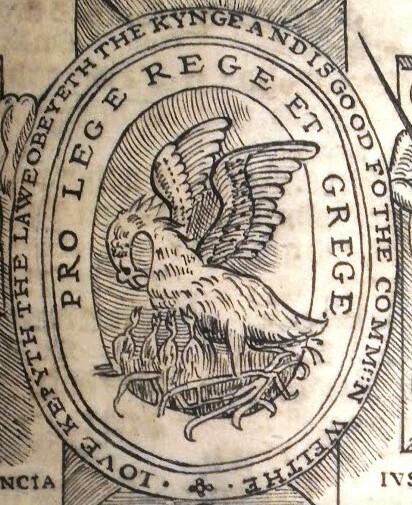 Judge’s printer’s device is prominently displayed: in the medallion is a pelican feeding her children by pecking her chest. Naturalists observed that the pelican had a red tip to its beak and small areas of crimson plumage; they therefore reported that the pelican fed its young with blood flowing from its breast. The reddish tinge on the pelican is in fact natural colouring, and the behaviour of the pelican which may have resulted in this legend is part of its ordinary feeding process. The pelican has a sack which acts as a container for the fish that it feeds to its young. When feeding its chicks, the bird presses the sack back against its neck in an action which mimics opening its breast with its bill. [i] One of the most popular books of the Middle Ages, Physiologus, contains a number of moralised tales about beasts. Anon, Physiologus: A Medieval Book of Nature Lore, 1587, translated by Michael Curley, 2009. [ii] J. Vinycomb, Fictitious and Symbolic Creatures in Art, 1909. What types of volunteering opportunities do you offer at The Angus? There are many different ways to get involved with the work of The Angus. We would like to hear from you regarding what your interests are and see how your skills, gifts and abilities can be used to help us continue to develop The Angus. What benefits are there to volunteering and what training will I receive? We will provide an induction tailored to each volunteer position, including: Background History, Information about The Angus and its Collections, Health and Safety, Handling Fragile Documents, Equal Opportunities, Safeguarding Policy, Volunteer Policy, and Procedures. We will also provide relevant training agreed upon according to an individual’s development needs. How much time must I give and is there a minimum commitment? The Angus Library is open 9.30am – 4.30pm (Monday – Friday). Volunteer hours will be agreed upon with each individual; the majority of volunteer work will take place within the opening hours, however some roles do require weekend hours which will be specified within the role description. What skills and experience do you ask for? Volunteer placements are made after an informal chat during which the applicant’s skills, talents, interests and desires will be discussed so that a suitable role can be determined. Can I claim for my expenses? We will reimburse all reasonable volunteer expenses, such as travel costs. We are also able to provide lunch if a volunteer is on site between 1pm-2pm. Will I have to undergo a police check? The need for a police check depends on the volunteering role and will be specified in the role description. We currently only accept volunteers aged 18 or over. There are no upper age limits to volunteering at The Angus. If you have any further questions about volunteering, please let us know. Learning and Participation Officer – Last Chance to Apply! The closing date for applications for the Learning & Participation Officer is tomorrow, 21st March at 12pm Midday!! If you still wish to apply, please email anja.clark@regents.ox.ac.uk for an application pack. Learning and Participation Officer Wanted! Regent’s Park College (RPC), a Permanent Private Hall of the University of Oxford, has a part-time, grant- funded position for a Learning and Participation Officer. RPC has secured funding from the Heritage Lottery Fund (HLF) and the Baptist Union’s Newington Court Fund to deliver an exciting project which will enable The Angus Library and Archive (The Angus) to reach a wider audience resulting in greater participation. We are therefore looking to recruit an enthusiastic, highly organised and motivated person with educational experience in the museum, archive or culture sector, to fill this varied and interesting post. This position will focus on coordinating the outreach activities by liaising with schools and heritage groups and assisting with the development of exhibitions and seminars to promote treasures held in The Angus. The role will also involve launching online teaching materials for KS3 and supporting Archive Taster sessions. The role requires previous experience in public engagement in the museum, archive or other cultural sector. Knowledge and experience of Heritage Lottery Fund projects would be desirable but not essential. For more information regarding this position or to request an information pack please contact the Project Administrator, anja.clark@regents.ox.ac.uk or (01865)288142. Closing date is 12pm Thursday 21st March 2013. Interviews will be held on Wednesday 27th March 2013. The main part of a HLF Round 2 application is the Activity Plan. This is a comprehensive document that discusses in detail the project and more specifically the outreach activities that will be udertaken as part of the project. This week, has been very busy with the project recieving coverage in the local media. Regent’s Park College (RPC), a Permanent Private Hall of the University of Oxford, has a full-time, 3 year, grant- funded position for a Project Administrator. RPC has recently secured funding from the Heritage Lottery Fund (HLF) and Baptist Union’s Newington Court Trust to deliver an exciting project which will enable The Angus Library and Archive (The Angus) to reach a wider audience resulting in greater participation. We are therefore looking to recruit an enthusiastic, highly organised and motivated person to fill this varied and interesting post. This position will provide administrative support for the newly developed outreach project, alongside providing office management and administrative support for The Angus, in particular the College Librarian. Experience with HLF projects would be an advantage. For more information regarding this position or to request an information pack please contact the College Librarian, emma.walsh@regents.ox.ac.uk or (01865)288142. Closing date is 5pm 25th January 2013. Interviews will be held on the 30th January 2013. Well 2013 is here which means the start of our exciting new project. Thank you everyone for your congratulations it has been a long road thus far but now the fun starts. The news has spread and has been reported in the news section of the National Archives website and in the online denominational newsletter Baptist Times. We are continuing to promote our successful grant application and would be happy to talk with anyone further about it. The first steps to be taken are the setting up of the project with much of the activities beginning in a few months time. The key tasks that will be initially undertaken will include the appointment of the Project Administrator and also the first meeting of the Project Board. The Project Administrator will be a full time position what will provide admin support for the project and also The Angus, this is a crucial role in ensuring the smooth running of the project. We expect to advertise this position this week and information will be posted on the blog once this has happened so stay tuned. Once again thank you for all your well wishes, please check back to the blog often as we will be updating it regularly now that the project has begun.